The taste of this satay chicken is so authentic and wonderfully delicious. The recipe was from a friend who was a chef in Malaysia. How could it be? We held a Hong Kong style BBQ party some time ago, grilling foods on charcoal. The Malaysian chef bought some marinated satay chicken to share with us. The chicken was so tempting that nearly everyone there liked it very much. At the end of the party, we all begged him for the recipe. He was so generous to share with us that all of us brought the best thing back home. The best thing is that we can cook this satay chicken whenever we like. Unfortunately, I don’t have any charcoal BBQ burner at home. So I baked the marinated chicken instead. The meat was very soft and succulent. Comparing with grilling and baking, I’ll vote grilling of course, yet this baked satay chicken didn’t let anyone down in my family. Yummy too! The secret is to use all those spices to marinate chicken for at least one day. Cut chicken thigh into 1 to 1 1/2 inches in thickness. Smash onion with a food processor. Mix all ingredients, marinate chicken and put in a fridge at least one day. Preheat oven to 200C. Soak skewers in cold water for 10 minutes. 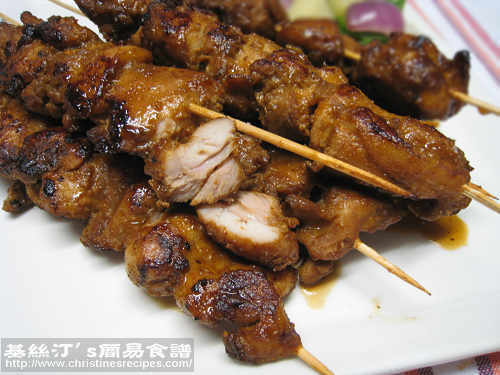 Skewer marinated chicken. Heat oil in a frying pan over medium heat and cook chicken until both sides are light brown. You don’t want to burn them, so be careful as some sugar was added into the marinade. Line a baking sheet with aluminum foil for easier clean up then spray with cooking spray. Bake for 25 minutes. Brush with honey when almost cooked. Insert a needle into the thickest part of the chicken. If no liquid runs out, it’s done. Serve with salad, or peanut satay sauce. The meat looks so tender and tasty... with those finger licking good sauce! I'm a fellow "hongkie" and I absolutely love your recipes! :) One question though, what do you mean by chicken powder? Do you mean chicken bouillon or chicken "five fragrant powder"? Thanks heaps! Exactly, it's chicken bouillon powder or called Chicken Broth powder. I used the brand "Maggie". That's great. Thanks for your info. The Knorr chicken powder is good. What do you mean by fry the chicken? Do you mean in a deep frying oil? Can I use beef (if so, what type of beef should I use - tenderloin, rib steak, sirloin?). What temperature can I cook it in the oven? Beware that beef will turn tough if cooked too long. It's better to use good quality cut, like tenderloin or rump. Can I do the marinade on the spot and not put in in the fridge? I am doing this for my food and consumer education test and this will all have to be done within an hour. I was also wondering what cooking spray was. The chicken meat needs time to pick up the marinade flavour. So to get the best results, you need to marinate the chicken in advance. Otherwise, the meat inside won't taste enough. Christine- if grilling the meat, is the pan fry step still necessary? If grilling, skip the pan-fry step. Hi Christine! I doubled this recipe and the color of the meat is very yellow in color unlike your picture. The meat is very tender but it is very bland despite blending 4 stalks of lemongrass and adding to the marinade and marinating the chicken overnight. Kindly advise how to improve it as I still have a lot of chicken left as they are not very tasty so my family does not want to eat. Thanks for your help! 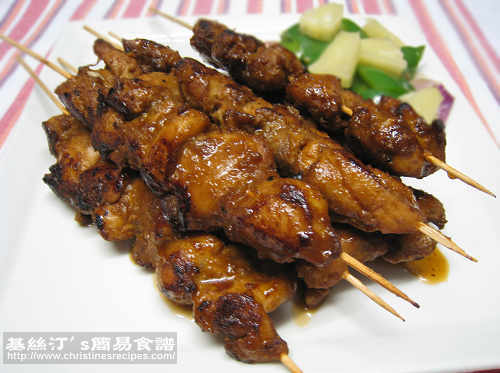 To my family, this chicken satay is very tasty. And I've tried this dish for several times. Maybe my family loves less-salty dishes compared to your family's preference. Everyone's preference of saltiness is very different. This recipe yields chicken powder. It's salty and has already mixed so much flavours inside. Supposed that you followed the recipe and doubled all the ingredients correctly as you wanted to make double size, the colour of the meat still wouldn't be yellow because the sweet paprika powder is dark red, and it will cover the yellow colour of other spices. Would the spices you used were different from mine? The lemongrass only adds fragrance not taste in your dish. You need to add more salt, or chicken powder if you doubled the recipe because your family likes more saltiness. Be careful, when you adjust the amount anyway.